Best Season : Whole year.. Significance : Famous for two landmarks i.e the Reis Magos fort and Reis Magos Church. The Reis Magos Church is one of the landmarks in Goa in the village of Reis Magos. Situated on the road which passes the famous Calangute and Candolim beaches, the church lies on the banks of river Mandovi in Bardez taluk, North Goa. Also known as the church of the Three Magi Kings, it is located inside the Reis Magos fort approached by a broad flight of steps. 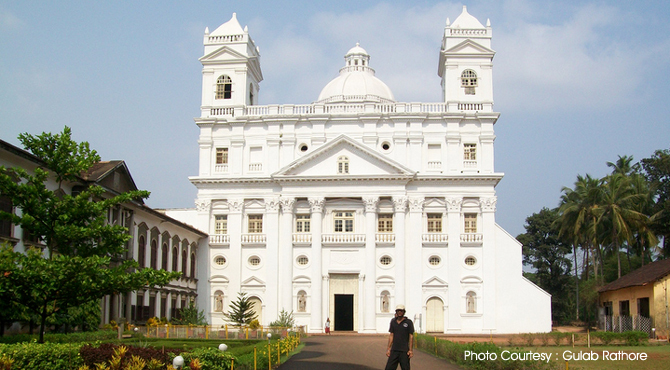 Visible from across the river in Panaji, it is the first church of Bardez Taluk. History says that Reis Magos Church is said to be the site of Alfonso de Albuquerque's landing in 1510. Built in 1555 by the Franciscan missionaries, it is dedicated to St. Jerome. The inside of the church was entirely remodeled in 1771 and the towers were added in around 1764. Some historians believe that the church was constructed on the ruins of an old Hindu temple. There are two bas-relief lion figures, at the start of the steps that lead to the Church, which are reminiscent of the Hindu Vijayanagar temple architecture. The exterior of the church carries the royal Portuguese coat of arms. Interior of the church is quite colourful and impressive. The highlight of the church is the elaborately carved multi-coloured wood relief showing the Three Wise Men (Reis Magos) bearing gifts to the baby Jesus. This is venerated behind the altar. Inside the church, the gravestone of the Viceroy Dom Luis De Ataide is set into the floor of the corridor north of the nave. There is a small shrine near the foot of the stairs, dedicated to Our Lady of Hope. The feast of the Reis Magos 'Festa dos Reis Magos' (Feast of the Three Wise Men) is held every year in the month of January. During this festival, local youth re-enacts the story of the three kings bearing gifts to the infant Jesus. There is carved yali balustrades, flank the bottom steps.